FC Barcelona are through to the semi-finals of yet another edition of the Copa del Rey after Thursday’s impressive 5-2 defeat of Real Sociedad (making it 6-2 on aggregate). That means the Catalans have now beaten the Basques 100 times in all competitions – just one of many top stats that we’re picked out from yesterday’s game. Of those 100 wins, 76 were in the league, 22 in the cup and two in the short-lived Spanish League Cup. One of the biggest heroes of the night was Denis Suárez, who scored in his second game in a row and also netted his first brace for the first team. That was the third time Denis has scored twice in a professional match. He did the same for Barça B against Hércules and also in his time at Villarreal, against the same Real Sociedad. Leo Messi has scored in six of the seven games played so far in 2017. He only missed out in the first leg of the cup semi against Real Sociedad. The Argentinian topped the good passes list on Thursday, making 37, one more than his compatriot Javier Mascherano. It was the third time this season that Gerard Piqué, Samuel Umtiti and Mascherano all lined up together. On the two previous occasions, with Mascherano at right back, Barça also collected big wins, 5-1 at Leganés and 4-0 at home to Man City. Real Sociedad have now lost twenty consecutive games at the Camp Nou. We have to go all the way back to a 1-1 draw in the 1994/95 season to find the last time that they came away from Barça's ground unscathed. 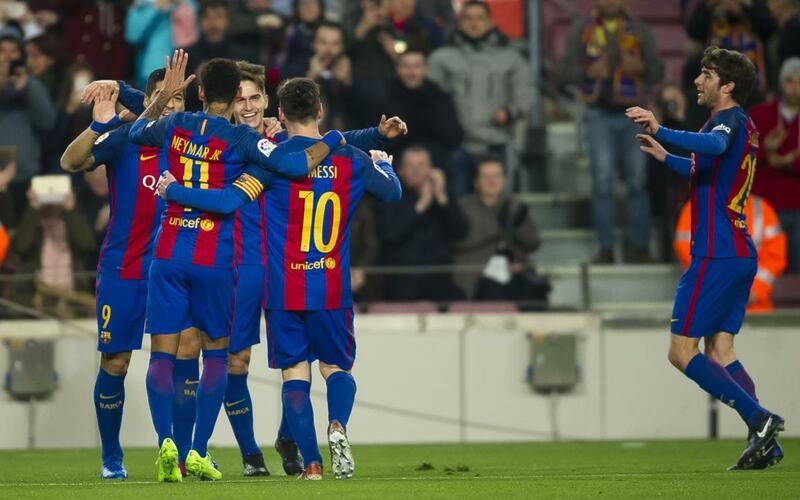 FC Barcelona are closing in on a century of goals this season. The five against Real take the tally up to an impressive 94.